The best guide to sumptuously succulent turkey. Why? Because life is too short for a dry holiday dinner. Shun the turkey jerky! 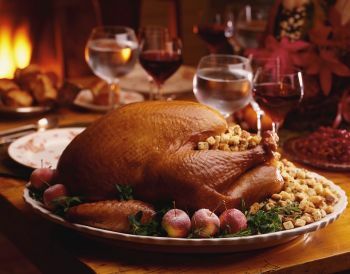 A trend has developed for cooking turkey at a very high temp – upwards of 500° Fahrenheit or greater. I’ve not tried this myself and I don’t plan on trying. Here’s why. By the time the thickest meat reaches minimum safe temperature, other parts of the bird are overcooked when roasting at a high temp. Also, by the time the middle of the breast (the thickest meat) reaches minimum safe temperature (165° F according to experts), the outer breast meat is significantly over cooked. This results in turkey jerky and is to be avoided! Perhaps more importantly, overcooked proteins pose a real health risk. I’d rather avoid large quantities of overcooked meat — and I’m planning on seconds and thirds on Thanksgiving! An important step for succulently juicy turkey is to roast your bird at a low but safe temperature. This allows for more even heat transfer throughout the bird as it cooks and results in even moistness. How low? I roast mine at 325° Fahrenheit — the recommended and minimum safe roasting temperature according to FoodSafety.gov. For a 12-pounder (see my article about bird size here), this is only about a 3-hour roast (turkey roasting chart here). Higher roasting temps may get your bird cooked sooner, but lower temps will keep the breast meat more evenly moist and your guests dazzled at your turkey triumph! This entry was posted in Campaign to End Turkey Jerky, How-To Guides and tagged Campaign to End Turkey Jerky, cooking, dinner, doneness, food, food safety, guide, holiday, how-to, meat, poultry, roast, roasting, safety, temperature, tips, turkey. Bookmark the permalink.